Hi U Create fans! I am super excited to be here for the Summer Fat Quarter Series. 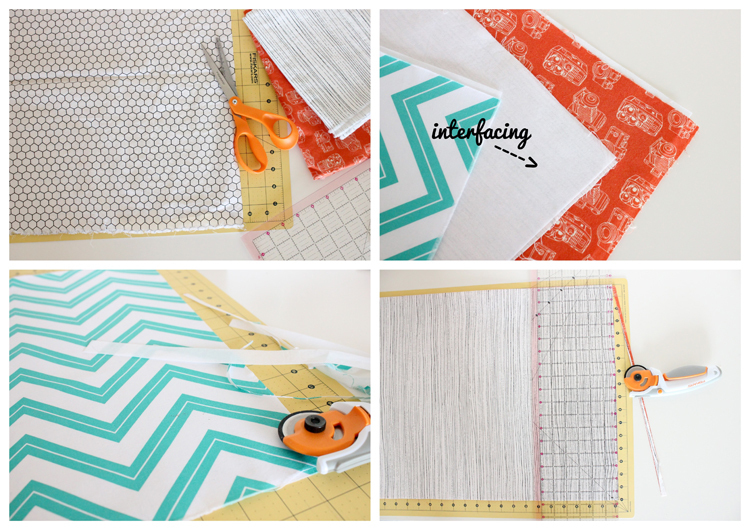 Today, I am sharing a simple project that takes just two fat quarters and some interfacing. 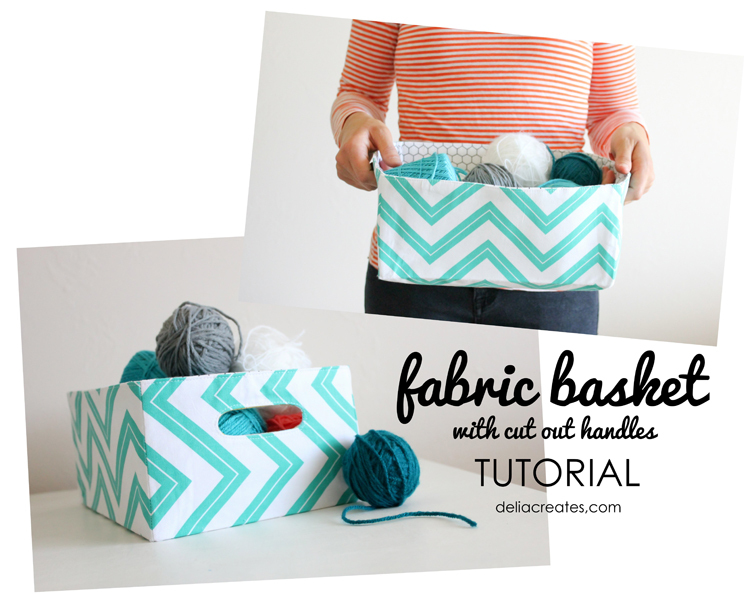 Please note: I made two baskets so you will see the fabric interchange in some of the steps. -Wash and press your fat quarters. Don’t have fat quarters? You can simply cut a 1/2 yard of 44 inch wide fabric in half (parallel to the selvage) to get two fat quarters. Cut your half yard of interfacing in half as well so that you have two fat quarters of interfacing. – Following the manufacturers instructions, fuse each piece of fabric with interfacing. 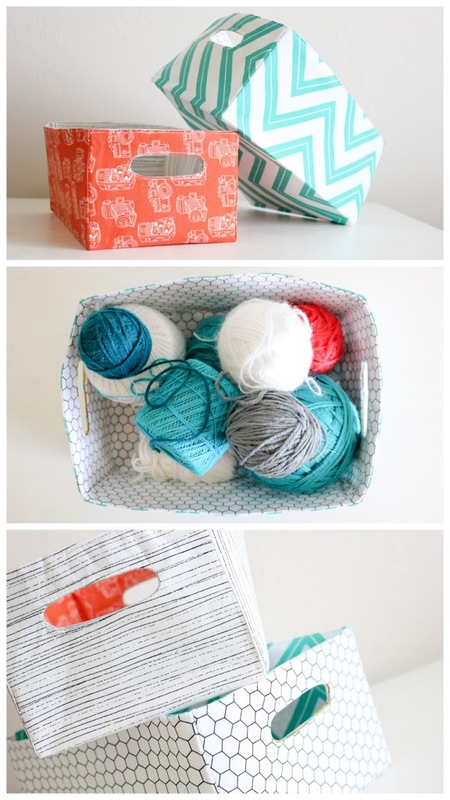 – Clean up the edges of your fat quarters to make everything nice and even and so that there are no frayed edges. 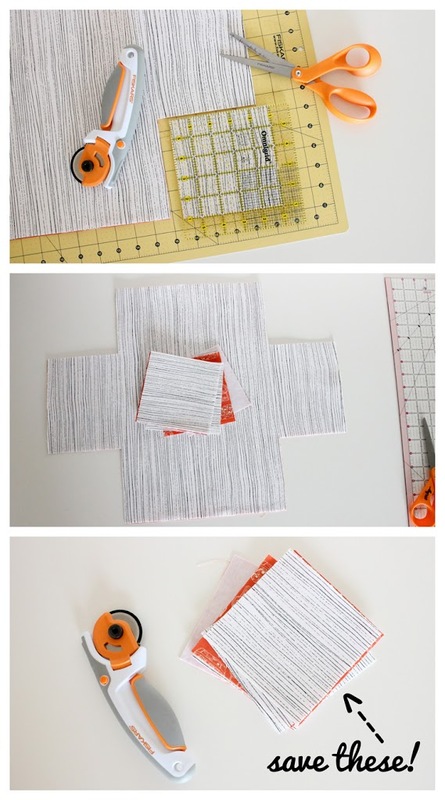 – Stack your two fused fat quarters and cut them again if needed so they are the same size. Sometimes, due to excessive fraying, you will end up with a slightly smaller basket (you can see a difference between the sizes of my two baskets). To help avoid this, you can buy a 1/2 yard, wash it and then cut it. – Cut five by five inch squares from each corner. To make sure things stay nice and even, do it while your fat quarters are still stacked together. For a reversible tote, keep cuts the same. If you only plan on having one side be the outer piece, go ahead and cut the liner piece slightly smaller. 5 1/8 x 5 1/8 inch corner squares should do fine. – Oh and hang on to those 5×5 squares! 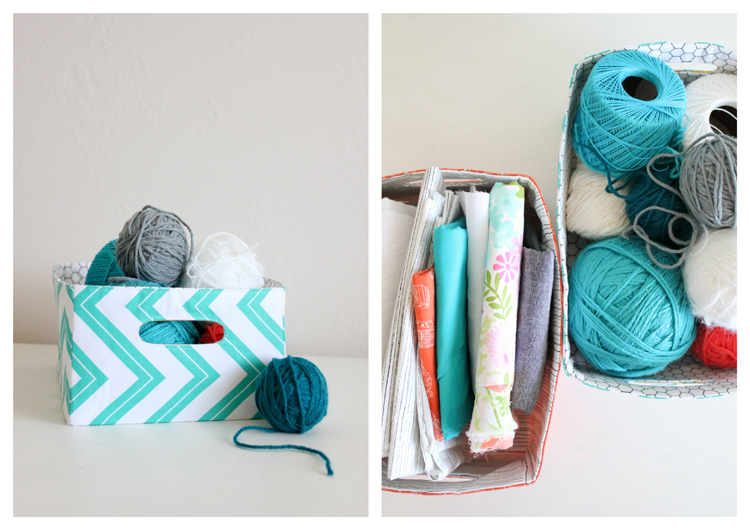 I am sharing three simple projects using them on my blog today. Go HERE to check them out. – Grab your scraps of fabric, I used non-matching pieces but it creates a cleaner look if you can match it to your fat quarters. Center them at the short ends of your fat quarters. Pin in place. – Center the fabric handle pattern piece about 2.5 inches down from the top. Trace. – Sew on the traced line. – Snip in the middle of the handle, then cut the inside of the handle out. 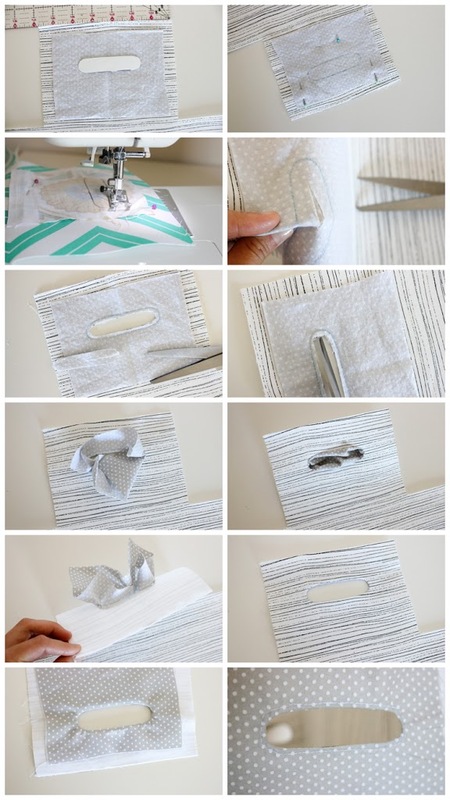 – Clip the curves without cutting through the stitches, push it through the hole and press with an iron. -Top stitch around the handle opening. *You won’t see top-stitching on the handles here because it was a change I added later. – Pin the corner edges together. – Sew with a 1/2 inch seam allowance. 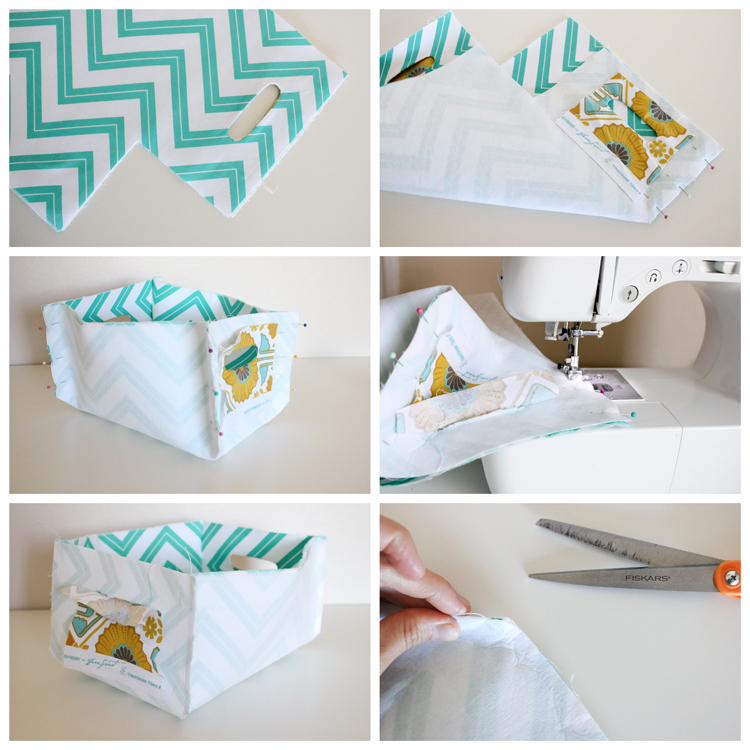 – Clip the corners and press open the seams. – Also press down the top raw edge 1/2 inch. – Turn one basket right side out and keep the other wrong side out. Nest them together. 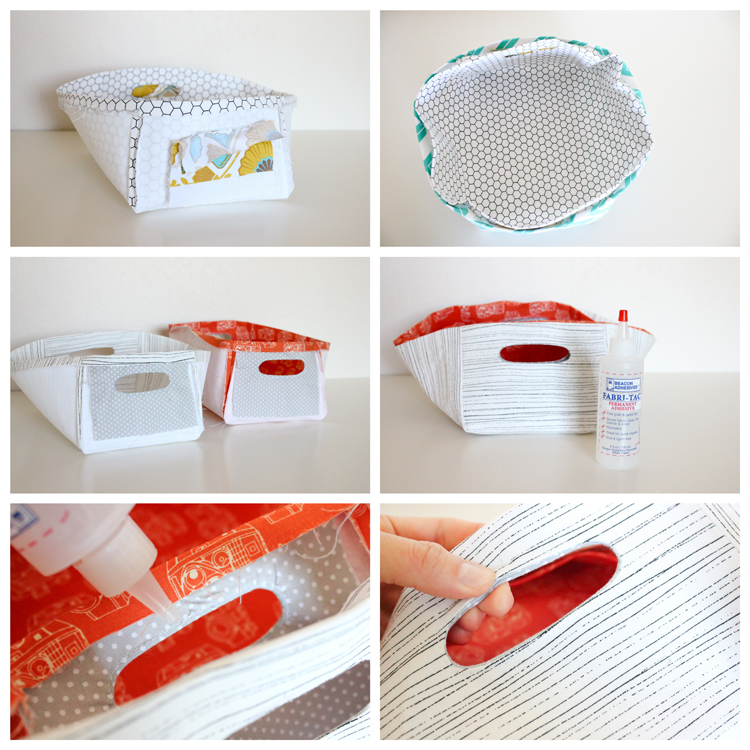 – Add a thin line of fabric glue around the perimeter of the wrong side of the handles and glue the baskets together at the handles. I don’t anticipate I will be washing these baskets much if at all, since it will soften the interfacing, but if you need to, fabric glue holds up to machine washes. – Pin around the perimeter of the basket. – Top stitch around. To create a cleaner look lengthen your stitch. 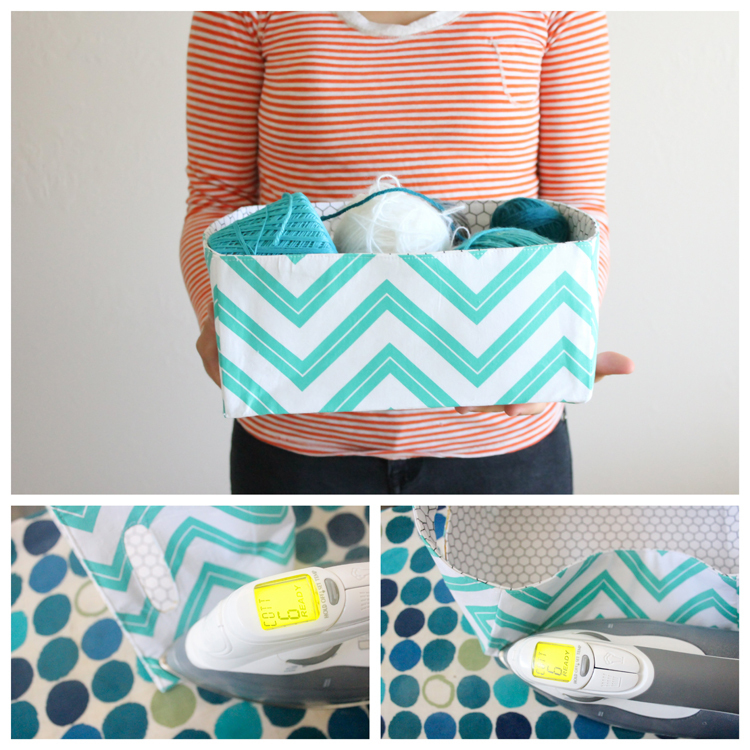 – Turn your iron on high with full steam and press it into a box shape. You will have to press each bottom edge and side seam several times before it takes shape. -If ever it loses it shape, simply give it another quick press. – If you made the basket reversible, you will have to re-press it when you switch to the other side. I do not recommend switching it too often, because it will wear the interfacing down over time. A pretty solution to your organization woes. 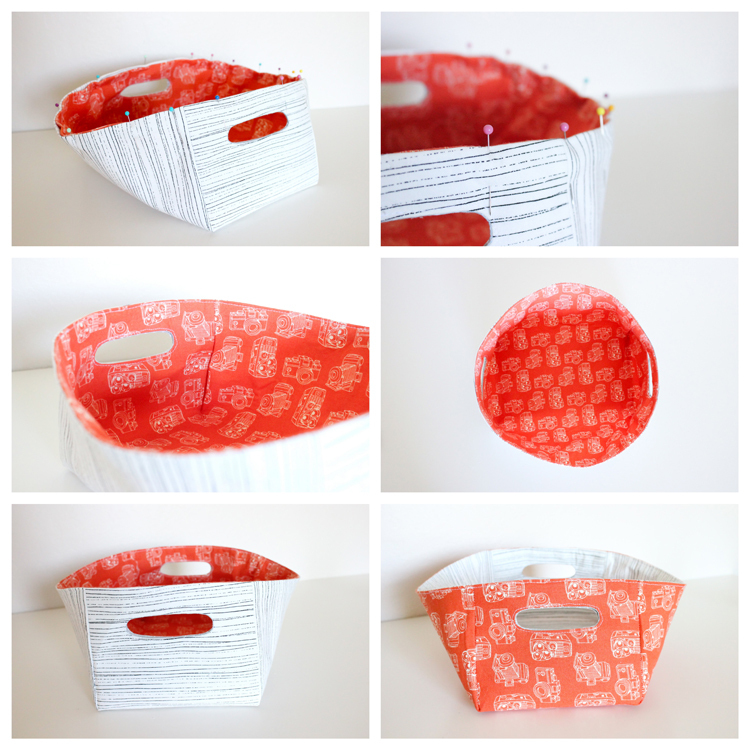 The sides can flex out depending on its contents…it is a fabric basket after all. But, as I mentioned earlier, you can repress it in shape if it gets out of whack, or just leave it rounded and don’t fuss with pressing it at all. They are such pretty things. 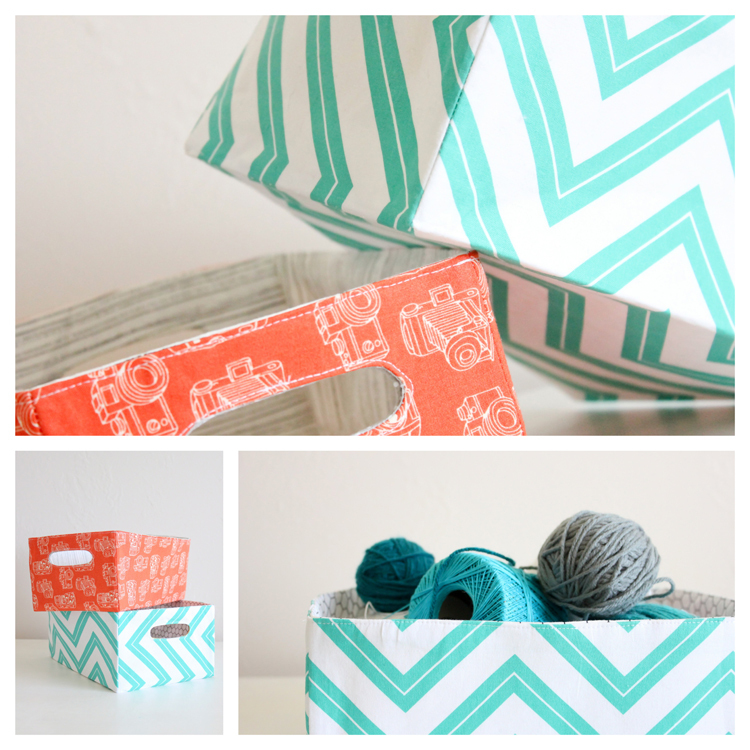 I have been using them to store WIP projects on my sewing desk. If you are wondering what to do with those 5×5 inch corners we cut out earlier, come by my blog (HERE) to see three easy projects I made using them! Thanks for having me over Kari! Love these baskets Delia!! Such a beautiful way to store pretty much anything! Gorgeous fabric, too. yay Delia! these rock! seriously good stuff. i LOVE LOVE LOVE your fat quarter series!!!! all of the ideas are so fantastic and creative! I look forward to seeing the rest of them! 🙂 thank you for doing this series! cute basket! What is the finished size? Delia does it again! Love the handles, very cute addition! Love this project! Can you please share what brand/type of interfacing you used? I want to make sure my basket holds up well! Thanks. Looks easy enough 😉 Thanks for the great tutorial Delia! Love these baskets and I want tyo tell you that you truly are one of my favorite Bloggers I follow I go straight to your email 1st everyday. You always have something that interests me. Thanks for Everything. Thanks for the great tutorial!!! I used your instructions to make some baskets for my nursery. They’re perfect for holding onesies and sleepers. Thanks for the excellent tutorial! I used your instructions to make some baskets for my nursery. 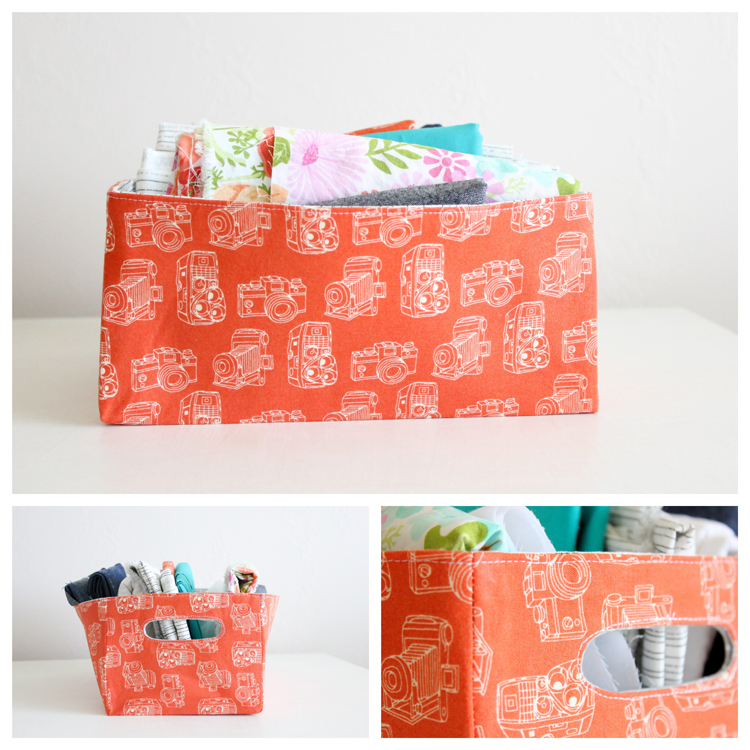 They’re perfect for organizing onesies and sleepers! Thanks for taking the time to share your skills and knowledge. They look great. What’s the finished size?